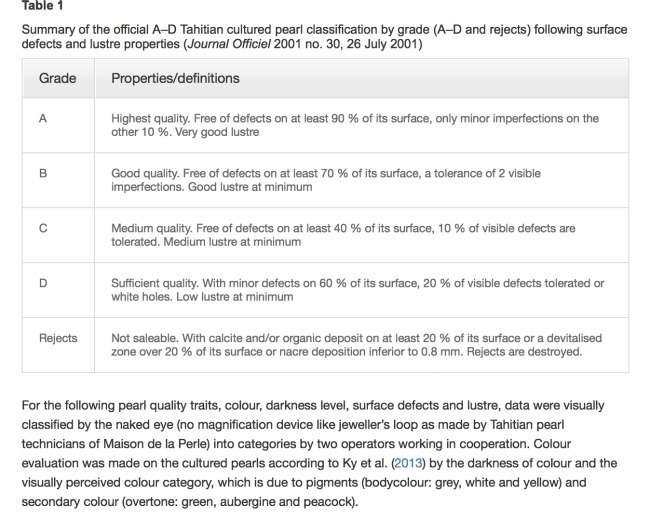 Aha - not all Tahitian Black pearls are bead nucleated. Natural black pearls from the black-lipped P. margaritifera oyster played a big part in Polynesian culture and legend long before any European explorer took his first step on the Polynesian islands in the 16th century. When the Polynesian islands became a French protectorate in 1842, a mother-of-pearl fishing industry flourished under the colonial government right throughout the rest of the 19th century. Natural Pearls were a valued by-product of this industry, though it was estimated that only one in 15,000 oysters would produce a pearl of any size. The only other major source of the black pearls was thousands of miles away across the Pacific ocean along Mexico's Baja California peninsula around La Paz. The Spanish began pearl fishing from the Pteria sterna oyster as early as the 16th century. It wasn't until 1961, that the Fisheries Service of the French Polynesian government began a trial culturing project in conjunction with two Japanese firms: Nippo Pearl Co., that had provided technical assistance to Australia's early pearl farmers, and Tayio Gyogo Ltd. There however was no commercial follow-up on both these pearling ventures. In the early years of black pearl farming, public lack of familiarity with black pearls led to rumors that they these pearls had been dyed. There was also a widely held belief that colors other than white were not even marketable. One pearl farmer, Jean Claude Brouillet (read more about Brouillet further down) who was trying to promote black pearl jewelry in London, Paris, New York, and Tokyo in the early 1970s, later described how the president of Cartier in Paris "used them as playthings" during their meeting. The Colors of Tahitian Black Pearls are Incredible! The amazing range of colors of the exotic Tahitian pearls covers the full-color spectrum. They can hit you all at once, in a single pearl, observed from the center of the pearl outward. Only a Tahitian black pearl can give you a pink and green color, mixed in the most unlikely combinations, without producing brown. Tahitian Pearls are unique because of their dark color. Most "black" Tahitian pearls are not as black-as-thunder color though and may be charcoal shades and a multitude of dark shades in between; the dominant and most popular color being green and peacock. True 'black as thunder' pearl color is very rare and true black pearls are among the most beautiful pearls in the world. Tahiti is the commercial center and trading hub for the Tahitian pearl industry, but surprisingly there are no actual pearl farms located around the island of Tahiti itself. The cultured pearl farms are located in the blue lagoons of the surrounding islands of Tahiti. The cultured black pearl lagoons can be found in the Tuamotu-Gambier Archipelago which is one of the five archipelagos of French Polynesia, and stretches as far east as the Gambier Islands, and beyond French Polynesia to the west into the Micronesian Islands. Australia, the Seychelles and Vietnam all produced black pearls, but those pearls are not considered true Tahitian pearls. The oyster mother that produces the black Tahitians is large, in fact, very large. Some black pearl oysters can be over 12 inches across and weigh as much as 10 pounds. These large oysters often produce much larger than average pearls. Not only are black pearls beautiful, but the black-lipped oyster's mother-of-pearl inner shell is also very beautiful and mother of pearl jewelry is highly desirable. By the early part of the 20th century, before conservation and re-population efforts had started, mother-of-pearl oyster had almost been hunted to extinction for its shell alone. Tahitian Pearls often referred to as Black South Sea Pearls typically range in size from 8mm to 16mm. If the pearls are smaller than 10mm they are considered "small" by industry standards and not as valuable as the larger size black pearls. The most popular size is 10mm - 12mm. Pearls above 13mm are considered large, rare and therefore more valuable. Tahitian pearl "farming" is a descendant of the Mikimoto pearl culturing process. Seeing a great potential for employment the French Polynesian government aggressively encouraged the development of new pearl farms. Entrepreneurs, Robert Wan of Chinese descent and Salvador Assel, a New York importer stepped in. While Wan purchased and expanded Tahiti Perles, a farming operation started by an Australian called William Reed, Asssel worked with Brouillet to expand his concern by building infrastructure and hiring expert Japanese pearl technicians. By 1976, the Wan farm was on its way to becoming one of French Polynesia's largest producers acquiring Brouillet's farm nine years later. Assel started marketing his pearls in the US in 1973 and became one of the largest distributors for a number of producers, including Wan. 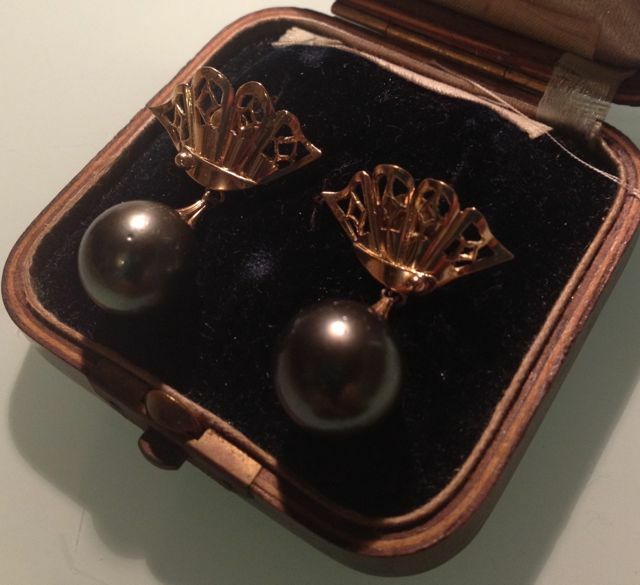 According to Goebal and Dirlam, (see reference below) this marked the first measurable success of a producer and distributor of Tahitian pearls or any pearls which had no Japanese affiliation. While the early discovery of the cultured pearling technique in Australia by William Saville-Kent continues to go unnoticed. Goebel M., Dirlam D. (1989) Polynesian Black Pearls, Gems & Gemology, Vol. 25, No. 3., pp. 130-148.